If you have already fallen in love with Young Living essential oils, you have purchased your Premium Starter Kit, you have checked out all the cool oily gear that you can use with your essential oils and you are looking for the next step - here it is! Essential Rewards! If you are like me and use Young Living from everything from your fruit to your kids to your toilet (yes, it's true), then a program where you can use your wholesale membership discount of 24% off retail price, get a discounted flat rate on shipping AND earn points back toward free oils is a no brainer. I wanted to take a second and answer some of the most frequently asked questions I get about Essential Rewards and show you what my ER order looked like this month. 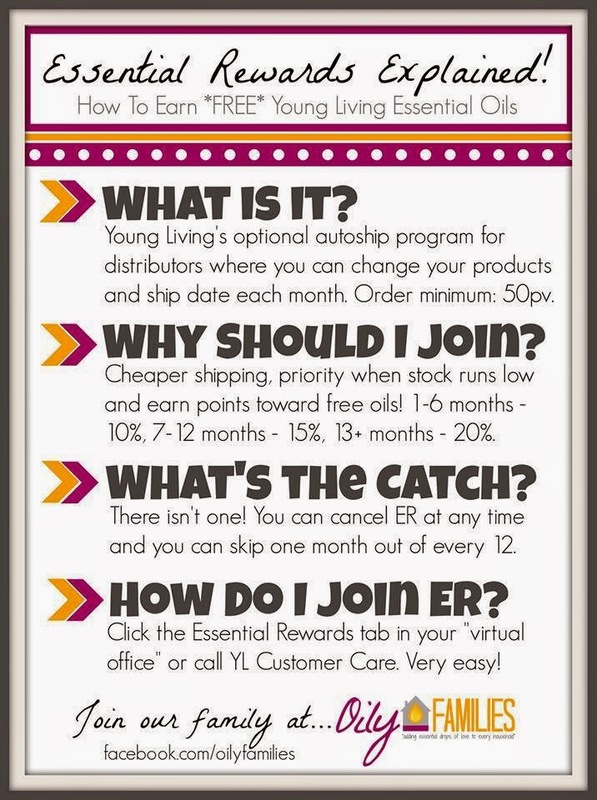 Young Living's Essential Rewards program is an optional autoship program for wholesale members. Each month, you can select a minimum of 50 pv of product, select a date and have it automatically shipped to your home at a discounted flat rate. What is the benefit of joining Essential Rewards? With each month's ER purchase, you receive a percentage of your purchase back in points that accumulate and you can use them toward FREE oils! If you needed another benefit, how about a discounted rate on shipping and priority over regular orders when products are about to go out of stock? What percentage do I earn back toward free oils? For the first 6 months, you earn 10 % back, and it just keeps getting better from there! For your second 6 months, you earn 15% back and after a year on ER, you earn a whopping 20% back on your purchases! Thankfully, there is no catch. You can cancel at any time (be sure to use your points before you do or you will lose them!) and you even get a grace month each year if you need to take a month off. When you log in to your virtual office, you can select the Essential Rewards tab and opt into the program. So simple! How do I redeem the points I have earned? So easy! Either call Member Services or log on to Live Chat. They will ask for your member number and your pin. Tell them you want to redeem Essential Rewards points, give them your list and they will verify your address, tell you the shipping amount and you are good to go! 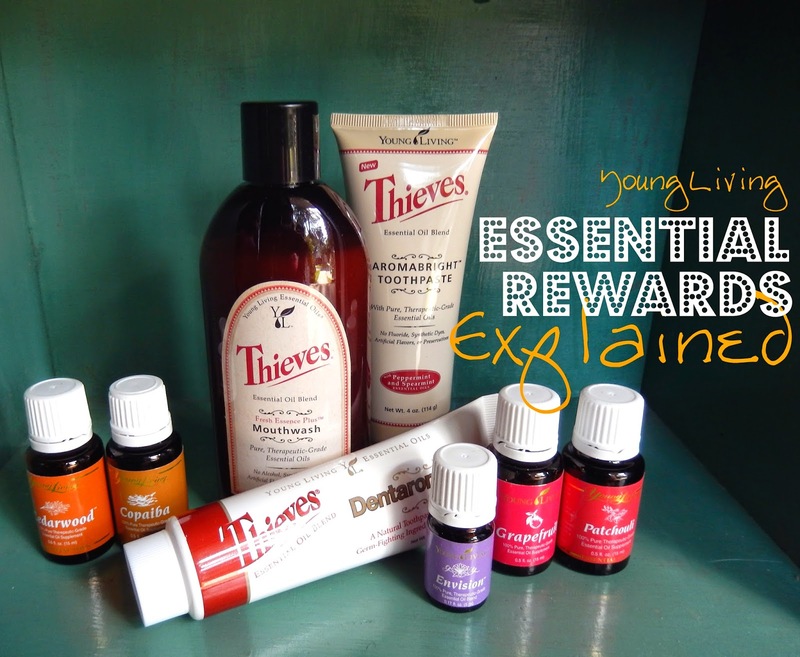 How long do I have to be on Essential Rewards before I can redeem my points for oils? You must be on ER for 3 months before you can redeem your points. Can I redeem my points for anything? You can redeem your points for anything that has the same PV and dollar amount. For instance, Deep Relief is 21.75 pv and also $21.75 - it is eligible! But roller balls are $9.75 and 0 pv, so they are ineligible for this program. Take a look at my Essential Rewards order that came in this week. Each month I choose different items. Sometimes I am replacing oils that I am out of (often this is Believe, Lavender or Thieves), adding new things to my stash, trying supplements or household items (Thieves household cleaner, toothpaste, soap, etc) and I even add items to my order for my mom or my aunt if they forgot to add something to their order. Last month I replaced my lavender and tried some Slique, the month before that was another combo of oils. All of us are totally thrilled to see the Young Living box on the front porch! My 3 year old daughter runs up to the porch yelling, "Mom, the oils are here!" I love it. 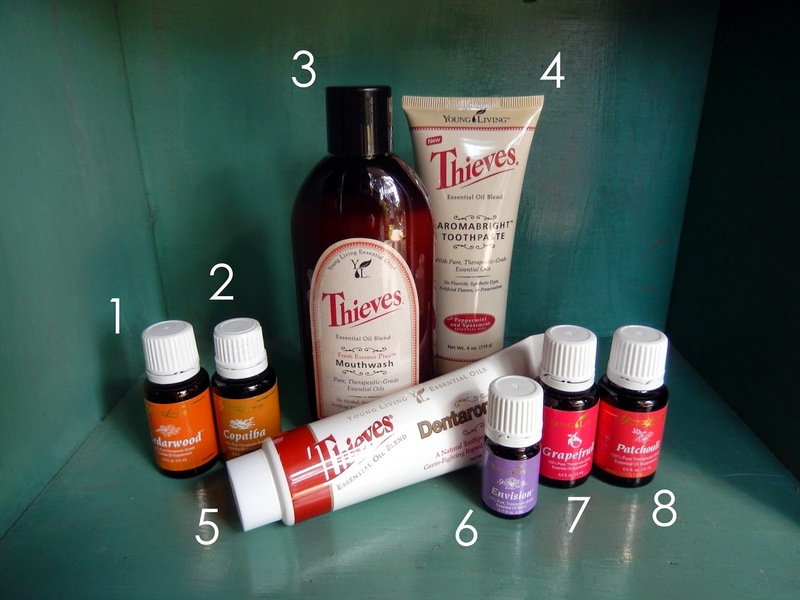 Want to know how to purchase your own oils? Check out this info here! Please remember that I am a Mama and not a doctor. These things work for us and I am in love with using homeopathic and oily remedies for health in our home and I am excited to share them with you, but please use your best judgement for your own home. Hi! Thanks for the post. I am still new to Young Living. What reference book would you recommend? I have purchased gentle babies. I've been applying peace and calming and lavendar to my 2 1/2 year old undiluted. I am wondering if I need to dilute. Do you just dilute in your hand? I personally use those oils on my girls undiluted, but use your best Mama judgement when it comes to your own children. When I dilute, I put a pea sized glob of coconut oil in my hand and let it melt, then add the oils and mix with my finger. Happy oiling! FANTASTIC information! Thanks for putting this together AND for making the graphic! I've been trying to explain to people(downline as well as interested non-members) ER and it's benefits, and I always feel like I'm leaving something out. Now I can link them here or to your graphic for the condensed version. :-D Thanks again!